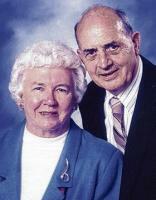 "Trimble family, So sorry to hear about Betty's passing. My..."
"Mike Sorry to hear about your Mom. Kevin"
"Hi Trimble Family, I saw this, this morning and keeping you..."
Betty Lou Aina Trimble, 88, a longtime resident of Vancouver, WA, passed away peacefully in her home, surrounded by family, on Thurs., Dec. 7th. She was born on May 27th, 1929 in Portland, OR to Oscar and Elizabeth Edlund. She was one of three children: she had two brothers, Richard and Robert. When Betty Lou was seventeen, she and her family moved to Silverton, OR. She attended Silverton High School and graduated in June 1948. In Silverton, she met her husband, Kenneth Trimble; they married in September 1948 at Immanuel Lutheran Church. While she lived in Silverton, Betty Lou was a member of Order of the Eastern Star Ramona Chapter #58. A talented swimmer, Betty Lou taught swim lessons and acted as a lifeguard for the Silverton pool. Swimming was something that brought Betty Lou delight and serenity, even as she reminisced about fond memories later in life. Betty Lou and Kenneth had three children between 1949 and 1960. In 1960, she and her family moved to Vancouver, WA. Betty Lou became an active member of St. Paul Lutheran Church in 1961, and that community became her second home for many years. She was an outstanding mother to her three children, an accomplished cook and baker, and a master seamstress. She found time to learn and read: she enjoyed taking night classes to expand her skills. As a Vancouver resident, she joined the Covington Club and held presidency. Her family and friends, especially those within her church community, were the brightest joys in her life. After her husband Kenneth passed in 2008, she found comfort in her personal interests such as creating puzzles, reading, and feeding the neighborhood birds and squirrels with her two grandchildren, Eva and Eric. She held a special place in her heart for all animals; she adored her pets, Toby, Maxi and Molly, and enjoyed their companionship until their earthy departures. Betty Lou is survived by her three children, Linda (Dennis) Harding, Michael (Frances) and Patrick Trimble; her grandchildren, Eva (Jeffery) Cole and Eric Trimble; as well as her nieces, Aina and Tina Edlund and nephew, Richard Edlund and their families. A special and heartfelt thanks to the PeaceHealth Southwest Hospice and HomeCare team for their dedicated care and the empathy and support they gave to our family. In lieu of flowers, Betty Lou and her family would appreciate contributions given to the St. Paul Lutheran Church and PeaceHealth Southwest Hospice and HomeCare. A private memorial service for the family will be announced at a later date.